Uncontrolled foaming can lead to sanitizing problems. Control and Elimination Is Important, for Water Quality. Managing foaming, in a spa or swim-spa!!! Sanitizing is a must, for proper spa water management and oxidation is required to decompose organic wastes. Body oils and organics can react with the natural alkalinity, of the water, and create soaps, which add to foam formation. Oxidation and water chemistry are factors, in controlling and eliminating foaming. Salt Chlorine generators are a better way to utilize chlorine, producing more controllable sanitation and oxidation results. 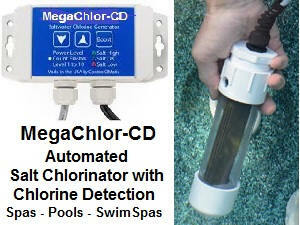 They eliminate the need to handle, measure or store chlorine products, while reducing buildup problems. 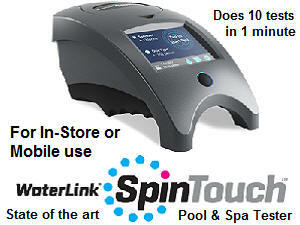 An Electronic PockeTester Kit is a convenient way to monitor the salt level, as well the overall water chemistry. How to control and eliminate undesirable foaming, in a spa? Foaming and scum formation are serious detractions from the goal of crystal clear spa and hot tub water. Spa chemicals generally do not cause foaming, although biguanide can cause some low level foaming. The most common cause is the reaction of body oils and cosmetic residues with the natural alkalinity of the water. This can lead to the formation of "soaps" and the possibility of a foamy water problem. While an anti-foam can help, the problem may recur. Foaming spa water can be controlled and eliminated with the use of Enzyme Products and avoiding "soft" water conditions. Proper sanitation requires that all foam be eliminated periodically, because the foam can support a microorganism population and may not contain adequate sanitizer. If problems arise, refer to the Spa Problems Page, as a source of problem-solving information, broken down into various categories. Scroll down the page and click on the linked keywords, catch phrases or images, in the archived answers below, to access additional information, on that topic or product. Great web site and I searched everywhere for a answer first. And I also asked my spa dealer and a chemical company and neither bothered to reply. By a stupid mistake I put way too much anti foam in my spa tub. It turned the water cloudy and two weeks later still cloudy. Is my only option to drain and refill? Thank you for your time. Best regards. The anti-foam is pretty harmless stuff and is probably food grade. Unfortunately, it is an emulsion and cannot be filtered out. Your best bet is to drain and clean the spa. Make sure you thoroughly clean the spa filter, as well. When adding anti-foam, adding more is not necessarily going to make it work better. I am sure that this will solve the problem. Thank you Alan, You are the only one to take the time to answer my question. I have asked chemical sellers and even the place I bought the spa from. You have a customer for life on any product I need that you carry. Best regards. ► Foam In A Spa? What causes foamy water in a spa? What's the best way to deal with the problem? Bathers contribute body oils to the water, as a result of the warm water. These body oils can react with the natural alkalinity of the water and form "soaps." Add aeration and you get foamy spa water. You can use a spa formula Anti-Foam Product to help break the foam. An Enzyme Treatment can be added periodically, in order to digest or decompose the body oils and prevent the formation of these "soaps." Soft water will support more foaming. Keeping the calcium hardness level in the 150-200 PPM, can help suppress foaming. Water testing is important and tests, such as calcium hardness and total alkalinity are also important, in terms of foam control. I recommend the ColorQ PRO 7 Digital Water Tester, which does all the important tests, without color-matching or guesswork. It is important to completely eliminate all foam, for some period of time. This is necessary, in order to assure proper sanitation, because the ecology of the foam is different from that of the water. I hope that I have been helpful. Enjoy the spa. ► What's In An Antifoam? Alan, great site, I immediately added you to my favorites. One question regarding spa anti-foam solutions: all other products I use list their active and inert ingredients and % on the label, but not so with anti-foam products. Can you tell me more about the chemical is that is typically used, the %, etc, so I can look up the MSDS info, as I have done for Potassium Peroxymonosulfate, for example. Thanks. Anti-foam products are not pesticides and, as such, do not require that same type of ingredient disclosure, that is required of products such as chlorine or algaecide. At least not in the U.S. The various products, currently on the market, are not necessarily all based upon the same formulation or have the same activity content. Virtually all spa antifoam products are based upon a silicone oil in a non-ionic emulsion. The silicone content will vary depending upon the packaging and marketing strategy. A 10% silicone content would be a reasonable ballpark figure. These products are used a very low levels and have a low order of toxicity. In a spa, the elimination of all foam, at least periodically, is important for proper sanitation. If you have an ozonator, it can help reduce the foaming problem, by breaking down the foaming materials. I hope that I have been helpful. Enjoy the spa experience! ► A Spa With A Head? Sometimes my spa gets so much foam on top it looks like a head on a beer. I use bromine tablets and non-chlorine shock. I never use fragrances or other similar products. So which chemical is causing the foam? Thanks a lot. Actually, none of the chemicals are responsible. Body oils from bathers, react with the natural alkalinity of the water and form "soaps." The air jets create the foamy water. It is important for good sanitation reasons to eliminate all foam, at least temporarily. Foaming can be controlled with additions of anti-foam products. Enzyme products can help eliminate the body oils and reduce "soap" formation. If your spa water is soft, raising the calcium hardness to 150-250 PPM will help reduce foaming. I hope that I have been of assistance. ► Still Dealing With Foam? I know you thought you were through with me, but I still have a little issue with foaming. The spa I own has 4 pumps. On each of these pumps is a feature called therapy jets that increases the pressure of the water coming from each pump. When I run pumps 1, 3, and 4 without the therapy jets, there is zero foaming in the spa. But if I turn on pump 2 or add the therapy jets to any of the pumps, the spa foams. I've drained and refilled and this still happens. The water is sanitized correctly, I use the stain and scale preventives and water clarifiers the manufacturer recommends, and it has the correct hardness. Now what is happening to the spa? Thanks. The foam is mostly likely being caused by the reaction of body oils and/or cosmetic residues with the natural alkalinity of the water. This causes the formation of soaps. Try adding a weekly dose of an enzyme to help digest these byproducts. Make sure that the calcium hardness is about 200-250 PPM, in order to reduce foaming. Good luck and I hope that this information proves helpful. Alan, please help on a few issues I'm having with my spa. My son brings his friends over and my spa turns into a bubble bath. Besides changing the water out, what gets rid of soap and how fast does to work? Also, I live in the southwest where we have hard water and I've been thinking of switching to soft water. But, a friend I know uses reverse osmosis water and he has a lot of white scale on everything. What is the white scale in his water and would that help the foaming? Also, why can't you use bromine with a mineral filter or cartridge. I've bought a ColorQ tester from your site and I enjoy your insight on spa problems. Thanks. This "soap" is the product of body oils reacting with the natural alkalinity of the water. Increased numbers of bathers and prolonged bathing sessions can add to the magnitude of the problem. Soft water actually increases the foaming problem and high pH increases the soap formation. Very hard water, on the other hand, can result in soap scum formation. Adding anti-foam will temporarily eliminate the foam. Incidentally, good sanitation requires that all foam be eliminated from time to time. Adding an enzyme treatment periodically can help digest the body oils and reduce the soap formation. The presence of an ozonator can help destroy the body oils over a period of time and it turn can lessen the foaming. It would be a very worthwhile addition, if you don't have one. So far as I know, mineral sanitizers can be used with bromine, with the exception of one particular brand, as bromine will drastically shorten the life of their cartridge. I hope that I have shed some light on the subject. In short, limiting the bather load, adding enzymes, controlling the hardness and using an ozonator, should help produce less foaming. Thanks for the purchase of the ColorQ Photometer Test Kit. I hope it serves you well. We have a new (2 month old) spa that holds about 250 gallons. We use it every day - sometimes twice a day - two adults. It has an ozonator, an ionizer (silver) and we used MPS as a sanitizer. In the last two weeks, it developed a cloudiness. I used additional MPS - 3 tablespoons - and it cleared up. I usually add at least a tablespoon of MPS each day. Now it has developed a sort of scum floating on the surface of the water. The filters have been cleaned and replaced. Does this suggest to you that it is time to empty the spa and start all over again?? All of the test readings are adequate. FOR YOUR INFORMATION, I AM HIGHLY ALLERGIC TO CHLORINE - SO WE CAN'T USE ANY CHLORINE IN THE TAB AT ALL. Do you have any suggestions? Thanks. The addition of the MPS and the clearing up of the water, suggest that the ozonator output is not adequate to meet the demands of your spa. This is a heavy use situation, given the frequency of use and the smaller size of the spa. You probably should replace the water more often than every 3 months, as is usually recommended. I would add extra MPS, after each use and try and confirm that the ozonator is working properly. Use it for at least 3 or 4, 2-hour sessions daily. Adding an enzyme treatment could help digest this floating scum. I hope that this information will prove helpful. Spa water that is soft is more likely to foam. Raise the hardness to about 200 PPM, by adding a calcium hardness booster. Antifoam can be used to help control the foaming. Algaecides are not normally used in spas. If the product you added contains dimethyl benzyl ammonium chloride or something close, it should not be added again. This type of algaecide will cause foaming, even in a pool. An aerated spa makes it much worse. With proper sanitation, there is no need to add an algaecide. Draining the spa and starting anew might be the best option. I hope that this information will prove helpful. My spa water has tiny bubbles that appear when the pump is on. It seems to effervesce like soda water and disappear when the pump is off. The water appears to be very clear and there is no noticeable odor. What should I consider doing, besides changing the water? Changing the water, may not be the solution. Normally, water is replaced every three months, on average, more or less depending upon usage. It is probably carbon dioxide gassing off. Make sure that the pH and TA are in range. Adding a sodium borate product will help maintain the pH and TA and help prevent carbon dioxide from dissolving in the water. The bubbles might be forming as the temperature changes. If you have an ozonator, it does aerate the water, as a means of delivering the ozone. If you use biguanide, foam problems are unavoidable. I hope this information proves useful. ► Spa Chemistry And Foaming? I have been working on getting my spa water in correct chemical balance. What causes foam in the water? My alkalinity was low and my pH was at the upper end of the range. I increased the alkalinity and decreased pH. I now have foam. What gives? Thanks. Foam is promoted by "soaps" that are formed by the reaction of the natural alkalinity of the water and body oils and cosmetic residues. High pH and TA can make it happen more quickly. Aeration and high water temperature make it all occur. Good sanitizing practices demands that at some point all foam be eliminated. Defoamers are very efficient. More is not necessarily better! They work, but are temporary. There are things that you can do. Have the water tested for calcium hardness and raise the level to 200 PPM. Hard water is less likely to support foaming. In addition, add an enzyme treatment to the water, as this type of product will help digest the body oils and cosmetic residues that lead to the formation of soaps. Anything that you can do to reduce body oils and cosmetic residues would be helpful. I hope that this information proves helpful. I have foam in my spa and I use a mineral sanitizer. I was told to get a clarifier to use and that will work to get the foam down and in the filter. I shock it after every use and one and a half oz. every Friday. Will the clarifier hurt the mineral sanitizer? 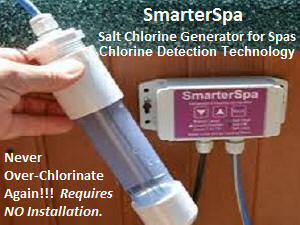 The clarifier should not interfere with the mineral sanitizer. Adding it weekly can help eliminate organic debris and improve water clarity. However, there is really no basis for adding a clarifier to control foaming. Foaming is the result of soap formation, caused by body oils and cosmetic residues reacting with the natural alkalinity of the spa water. Foaming can be temporarily controlled by the addition of a spa-formula antifoam product. Check the calcium hardness and boost it to 200 PPM, if the level is low (soft water). Hard water makes foaming more difficult. The addition of an enzyme product, on a weekly basis, will help digest oily residues and help eliminate the soap formation that leads to foaming. Enzyme products are safe to use with mineral sanitizers. I hope that I have cleared things up a bit. Enjoy the spa.